I apologise in advance as I rarely post 2 sweet recipes one after another. I’m scraping the bottom of the fridge and freezer to use up my ingredients. I’ve done my usual store cupboard stock take and found a couple of bits that needed using up. I know, I know, it’s such a hardship to eat an Ice Cream Cake in the warm weather. Before I forget, coming up in the next few days I have a lovely competition for my readers so do sign up for email updates on the right hand side to get a notification in your inbox. In this hot weather, only crazy people spend the day in the kitchen. So yes I am a bit crazy. After I checked through my stock levels, I found I had some cocoa powder, 1 egg, a bit of butter and some frozen raspberries left over. I put out an SOS to my sister who happily managed to grab me a block of vanilla ice cream. 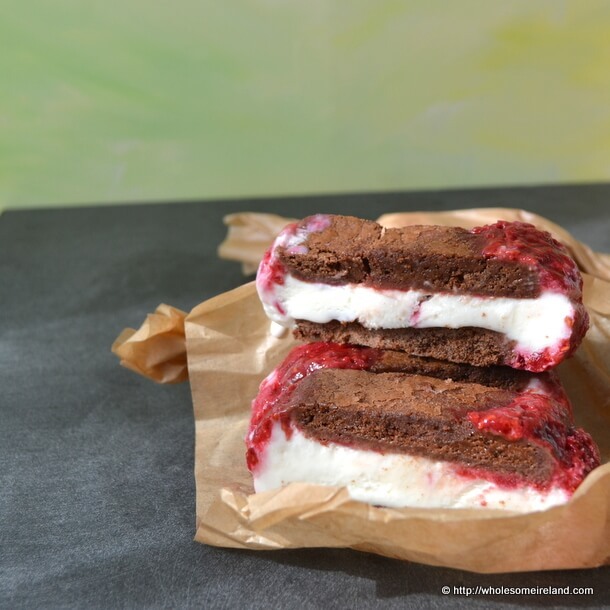 We haven’t the space for an ice cream maker here and actually a preformed block is perfect in this recipe. The FSAI have issued a warning for all imported frozen berries which may be contaminated with the Hepatitis A virus, you can read it by clicking here. My berries are Irish but in the off chance that you have the imported variety, I’ve adjusted the recipe to allow you to use up what you may have in stock safely. It’s not rocket science but this is a very frugal dessert, serving 8 people for just under 50c per portion. I’ve divided the ingredients into the stages at which you make it. The key to making the Ice Cream Cake is to make it the day before you want to serve it up. In a small saucepan, heat the berries, lemon juice and sugar to boiling point. Simmer for at least 3 minutes. Set aside to cool. Preheat a (fan) oven to 170 degrees Celcius. Line a baking tray with greaseproof baking paper. Get a loaf tin and line the full inside with cling film. Whisk the butter and remaining sugar together until light and fluffy, then beat in the egg, then finally the cocoa powder and flour. Beat until you have a stiff dough. Roll out to a rectangle on a floured board which will fit the full size of the tray, lift into place and trim the edges if you need to. Bake in the oven for 15 minutes. Before you take the tray from the oven, take the block of ice cream out of the freezer to allow to thaw slightly. Carefully while the dough is still warm use the loaf tin as a template to slice the dough into 2 long strips which will fit into the tin when cooled. You can eat the remaining biscuit here if you like. Call it the cook’s treat! Alternatively the left over biscuit will make for a very fine crumb on a banana milkshake cake. 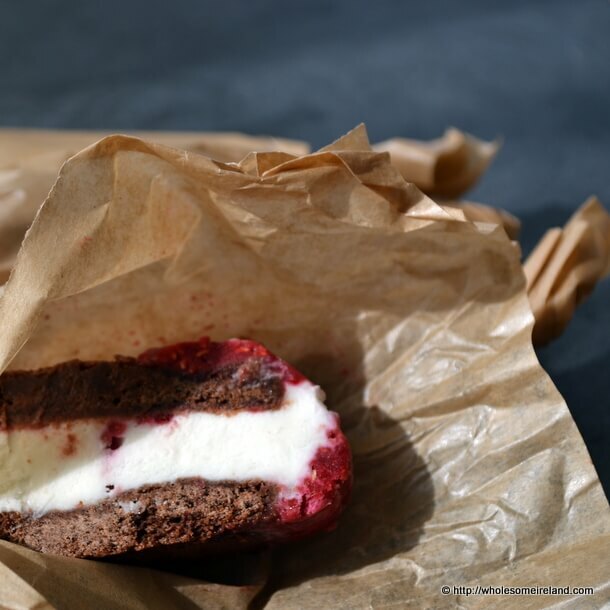 Or you could shape it into circles to make something similar to Like Mam Used To Bake’s ice cream sandwiches. With a spatula, lift the first piece of slightly warm biscuit into the bottom of the lined loaf tin. Next, slice the block of ice cream into chunks and press on top of the biscuit. Pour the cooked and cooled raspberries on top, then top with the second piece of biscuit. You can see that the raspberries ooze over the top and down the sides of the cake, which is a great contrast with the creamy vanilla ice cream. Cover the entire loaf tin with cling film and freeze for 3 hours before serving. I use a hot mug of water with a sharp metal knife to get straight lines and portions. 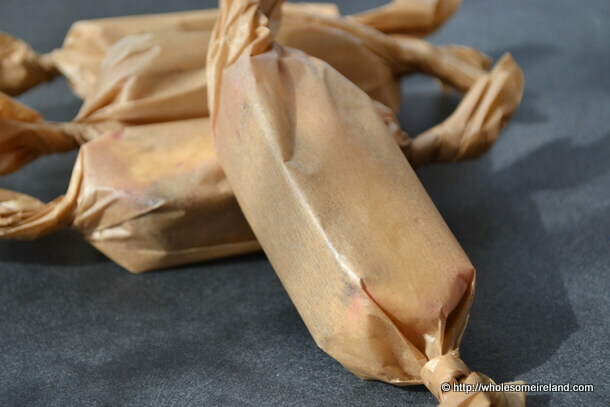 Then wrap in greaseproof paper, twist each end and refreeze as little parcels. That looks delicious! And I have similar ingredients in my larder press too, including some frozen, home grown, irish raspberries in my freezer…. Hi Jazzy! The raspberry cuts through the ice cream & biscuit really well. Strawberries will work perfectly C! This is simply an awesome cake!